With Christmas, New Year and Carnival this has made for a busy couple of months at REGUA. The summer is also a time when staff take a well-earned break, and have time for visiting family away from the Guapiaçu area. However, during the “quieter” time of the year, when there are fewer visitors, the priority at REGUA is to ensure that any maintenance or building words required at the Lodge are carried out. 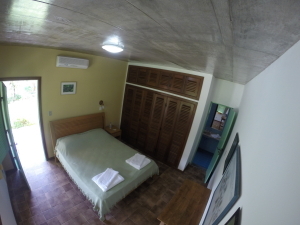 The main task during this Brazilian summer, was to block up the old entrance and bathroom doors from the lobby area into Room 5 and open up a new entrance off the veranda at the front of the lodge, and put a new door through to the bathroom. This makes Rooms 4 & 5 truly ‘en-suite’ and more private with the lobby area becoming part of Room 4. This noisy and dusty work had to be done in the closed season, and quickly, to ensure minimal disruption to our visitors. With the work completed and painted, it is hard to believe that there has been any change at all. Excellent work from the REGUA building team. In addition, the whole lodge is getting a coat of paint, the humid atmosphere takes its toll on the paintwork, and it is vital to ensure that this is regularly done. 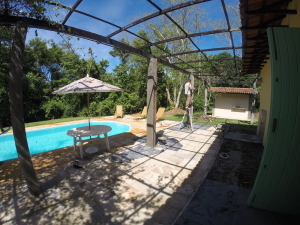 Some changes are also to be made to the pool area with some of the veranda columns being removed to open up the area. Maintenance work to the swimming pool and its surrounding area is also undertaken to ensure it is ready for the busy year ahead. The humid atmosphere and strong sunlight also badly affect our pool furniture with plastic made brittle and wood a target for both termites and mould, so sourcing replacement tables and chairs is a regular task. Tom Locke, our Lodge Manager is tasked with finding suitable replacements. Many who have visited REGUA will have used the reserve transport to get to some of the more distant trail heads. Others will have arrived by bus from Cachoeiras de Macacu, but all will have travelled over the small bridges that span the Guapiaçu River at some point. 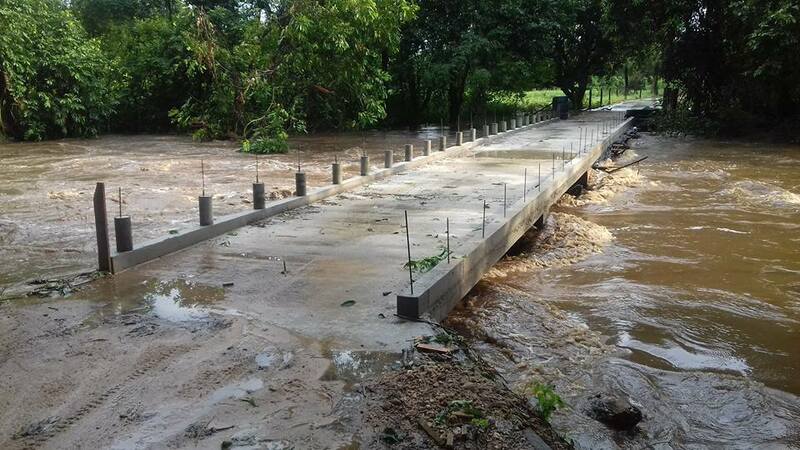 After 30 years of shouldering the heavy traffic from buses, farm equipment and the reserve vehicles transporting the saplings to planting areas; the bridge connecting REGUA’s headquarters to the Waterfall trail finally reached the end of its life. 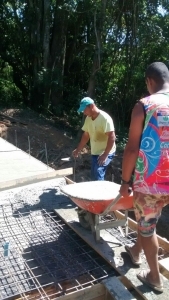 The old wooden boards had taken many summer floods and it was time for them to be replaced by an iron structure with a concrete road surface, and REGUA staff, under local builder Ruy’s expert direction, worked hard to have it completed by the end of January. Whilst construction was carried out the river could only be crossed using a 4×4. The rebuilding work came not a moment too soon, as with the summer rains came a deluge of water that would probably have washed the original bridge away. Friend of REGUA, Katerina, sent this photograph after one night’s rain. 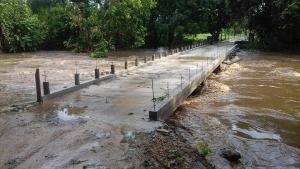 The bridge has been designed to have as little resistance to the power of the floodwater as possible, allowing the water to run right over it, minimising any damage. Hopefully the new bridge will last just as long as the original.